You can get control of your time and your life only by changing the way you think, work, and deal with the never-ending river of responsibilities that flows over you each day. You can get control of your tasks and activities only to the degree that you stop doing some things and start spending more time on the few activities that can really make a difference in your life. Successful, effective people are those who launch directly into their major tasks and then discipline themselves to work steadily and single-mindedly until those tasks are complete. The habit of setting priorities, overcoming procrastination, and getting on with your most important task is a mental and physical skill. See yourself as the kind of person who gets important jobs done quickly and well on a consistent basis. A major reason for procrastination and lack of motivation is vagueness, confusion, and fuzzy-mindedness about what you are trying to do and in what order and for what reason. Step seven: Resolve to do something every single day that moves you toward your major goal. Build this activity into your daily schedule. You may decide to read a specific number of pages on a key subject. You may call on a specific number of prospects or customers. You may engage in a specific period of physical exercise. You may learn a certain number of new words in a foreign language. Whatever it is, you must never miss a day. You need different lists for different purposes. First, you should create a master list on which you write down everything you can think of that you want to do sometime in the future. This is the place where you capture every idea and every new task or responsibility that comes up. You can sort out the items later. Second, you should have a monthly list that you make at the end of the month for the month ahead. This may contain items transferred from your master list. Third, you should have a weekly list where you plan your entire week in advance. This is a list that is under construction as you go through the current week. This discipline of systematic time planning can be very helpful to you. Many people have told me that the habit of taking a couple of hours at the end of each week to plan the coming week has increased their productivity dramatically and changed their lives completely. This technique will work for you as well. Begin today to plan every day, week, and month in advance. Take a notepad or sheet of paper (or use your smartphone) and make a list of everything you have to do in the next twenty-four hours. Add to your list as new items come up. Make a list of all your projects, the big multitask jobs that are important to your future. 2. Lay out all of your major goals, projects, and tasks by priority, what is most important, and by sequence, what has to be done first, what comes second, and so forth. Start with the end in mind and work backward. Often, a single task can be worth more than all the other nine items put together. 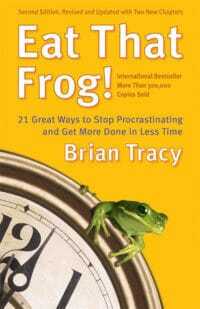 This task is invariably the frog that you should eat first. Can you guess on which items the average person is most likely to procrastinate? The sad fact is that most people procrastinate on the top 10 or 20 percent of items that are the most valuable and important, the “vital few.” They busy themselves instead with the least important 80 percent, the “trivial many” that contribute very little to results. 1. Make a list of all the key goals, activities, projects, and responsibilities in your life today. Which of them are, or could be, in the top 10 or 20 percent of tasks that represent, or could represent, 80 or 90 percent of your results? 2. Resolve today that you are going to spend more and more of your time working in those few areas that can really make a difference in your life and career and spend less and less time on lower-value activities. The Law of Forced Efficiency says, “There is never enough time to do everything, but there is always enough time to do the most important thing.” Put another way, you cannot eat every tadpole and frog in the pond, but you can eat the biggest and ugliest one, and that will be enough, at least for the time being. Rule: There will never be enough time to do everything you have to do. You can use three questions on a regular basis to keep yourself focused on completing your most important tasks on schedule. The first question is, “What are my highest-value activities?” Put another way, what are the biggest frogs that you have to eat to make the greatest contribution to your organization? To your family? To your life in general? The second question you can ask continually is, “What can I and only I do, that if done well, will make a real difference?” This question came from the late Peter Drucker, the management guru. It is one of the most important of all questions for achieving personal effectiveness.